MY LAST ASTRONOMY TALK WAS AT THE BETHPAGE PUBLIC LIBRARY ON 2016 NOV 14. MY NEXT TALK (FREE) WILL BE AT THE LONG BEACH MEMORIAL LIBRARY ON TUESDAY 2017 JULY 18 - 2:00 PM. OR GO LARGER IF YOU WANT WITH MULTIPLE PRESSES OF THE + BUTTON. The weather was very cooperative. We found a great spot between our hotels and the airport with an absolutely unobstructed view right to the horizon. (AP) -- Milky white chemical clouds were briefly visible in much of the night sky along the Eastern seaboard on Tuesday after NASA launched a series of rockets to study the jet stream at the edge of the earth's atmosphere. possible. So the window is driven by sunlight and moonlight conditions. TMA initially glows with a reddish color, but quickly changes to white. It is expected that the associated cloud trails will be persist for as long as 20 minutes before completely fading away. ROCKET #1 -- Will be launched on the highest and longest trajectory, reaching an apogee altitude of 250 miles (405 km), approximately 185 miles (300 km) east-southeast of Wallops Island. 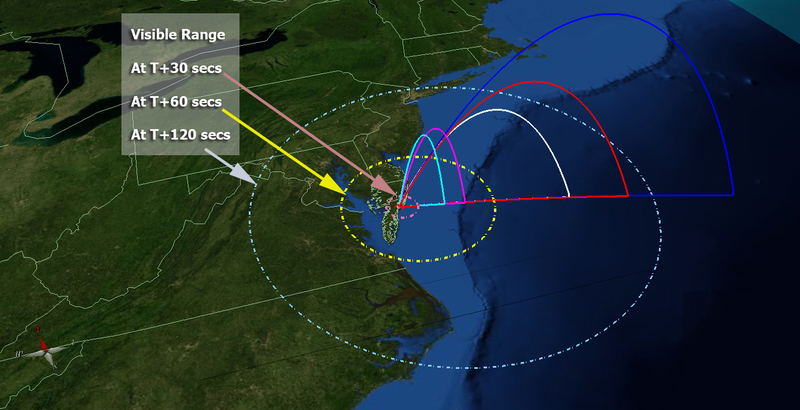 The TMA will be released as the rocket descends down through its "release regime" from 85 to 55 miles (135 to 88 km), approximately 340 to 360 miles (550 to 580 km) downrange from Wallops Island. Viewers should look toward the SSE. The TMA cloud should first appear at about 14-degrees above the horizon and moving downward, tracing a streak approximately 5-degrees in length. ROCKET #2 -- Will climb to an altitude of 112 miles (180 km) at a similar distance downrange from Wallops Island. Like the first rocket, this one too will release TMA only on the downleg of its suborbital arc. Look almost due south. This cloud should first appear about 19-degrees above the horizon, tracing a downward streak roughly 7-degrees in length. reaching a maximum altitude of 20-degrees, then dropping back down again to about 13-degrees. ROCKET #4 -- Will travel on the second highest and farthest path, reaching a maximum altitude of 155 miles (250 km), about 125 miles (200 km) downrange from Wallops Island. As was the case with Rocket #3, the TMA payload will again be released as "puffs" creating a curved, dashed arc. For the upleg puff, look SSW as the cloud makes a broken trail roughly 13 to 20-degrees. The downleg puff will appear toward the south, descending from 20 to 13-degrees. of the suborbital arc will be created in the SSW, starting at about 20-degrees and descending downward for about 7 or 8-degrees. The rockets themselves might also be glimpsed as "stars" moving rapidly upward before their engines shut down as they near the top part of their respective arcs. 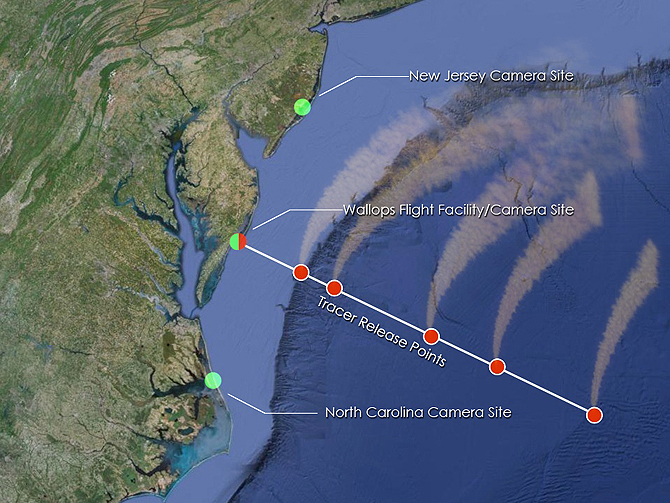 For the rockets to be launched, clear skies are needed at three different sites where NASA has set up cameras: South Jersey, Wallops Island and the Outer Banks of North Carolina. trimethyl aluminum (TMA) into the atmosphere from a launch site near Poker Flats, Alaska. The diffusion and distortion of the cloud trail are evident. Up to seven (7) trails are to be created high above the Eastern Seaboard by five rockets during the predawn hours of Tuesday morning. IF THE MAP BELOW IS TOO LARGE FOR YOUR SCREEN, HOLD THE CONTROL BUTTON DOWN WHILE YOU PRESS THE - KEY ONCE OR MORE TIMES. IT IS TO THE RIGHT OF THE ZERO KEY. CONTROL + WILL ENLARGE THE SCREEN AND CONTROL 0 WILL RESTORE THE ORIGINAL SIZE. Launch madness will hit the east coast in March as NASA launches five rockets in approximately five minutes to study the high-altitude jet stream from its Wallops Flight Facility in Virginia. The Anomalous Transport Rocket Experiment (ATREX) is a Heliophysics sounding rocket mission that will gather information needed to better understand the process responsible for the high-altitude jet stream located 60 to 65 miles above the surface of the Earth. The high-altitude jet stream is higher than the one commonly reported in weather forecasts. The winds found in this upper jet stream typically have speeds of 200 to well over 300 mph and create rapid transport from the Earth's mid latitudes to the polar regions. This jet stream is located in the same region where strong electrical currents occur in the ionosphere. It is therefore a region with a lot of electrical turbulence, of the type that can adversely affect satellite and radio communications. The sounding rockets being used for the mission are two Terrier-Improved Malemutes , two Terrier-Improved Orions and one Terrier-Oriole. 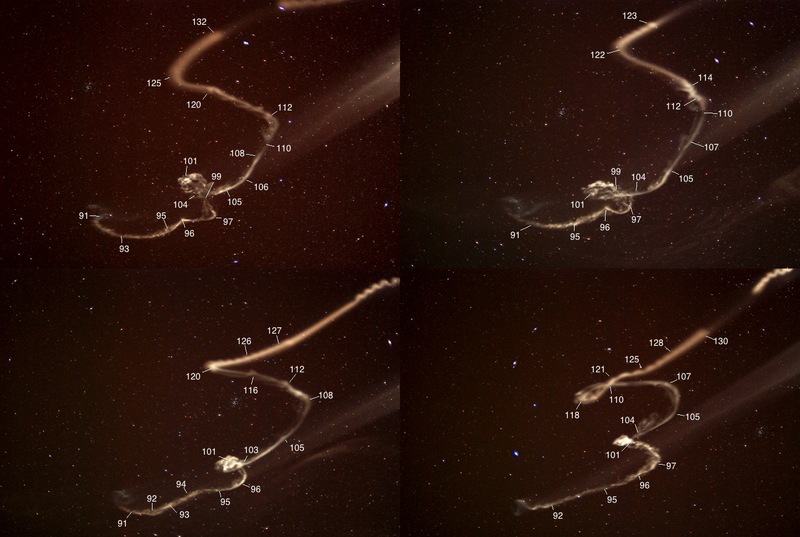 Four trimethyl aluminum (TMA) trails from a prior mission flown from Poker Flat, Alaska, in February 2009. Credit: Miguel Larsen/Clemson Univ. The five rockets will release a chemical tracer that will form milky, white tracer clouds that allow scientists and the public to "see" the winds in space. In addition, two of the rockets will have instrumented payloads, to measure the pressure and temperature in the atmosphere at the height of the high-speed winds. "Why the wiggles?" wonders Karl Battams of the Naval Research Lab. "We're not sure. There might be some kind of helical motion going on. Perhaps we're seeing material in the tail magnetically 'clinging' to coronal loops and moving with them. 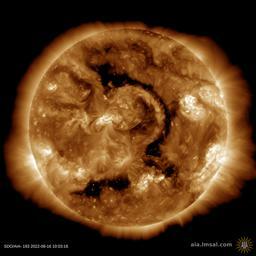 [Coronal loops are huge loops of magnetism that emerge from the sun's surface and thread the sun's atmosphere.] There are other possibilities too, and we will certainly investigate those!" Battams notes that these images can be combined with similar images from STEREO-A on the other side of the sun to produce a three dimensional picture. "When we pair these together, and throw in the SDO images too, we should be able to get an incredibly unique 3-D picture of how this comet is reacting the the intense coronal heat and magnetic loops. We are going to learn a lot." "We used a remotely-controlled 12-inch telescope in Malargue, Argentina," says Ebr. 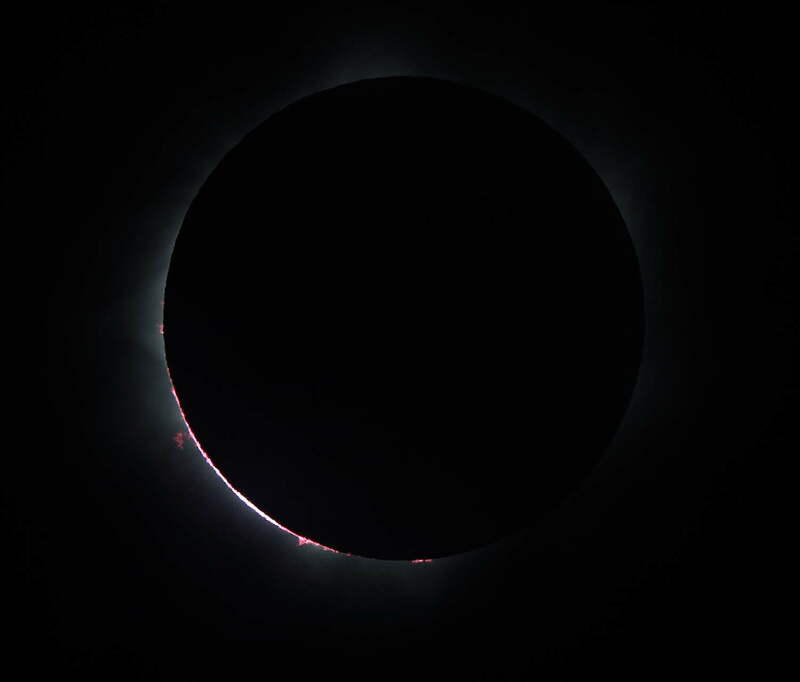 "The sun was below horizon at the time we took the picture, but just barely. There was only a 30 minute window between the rise of the comet and that of the sun "
The MSL spacecraft separates and heads on its way to Mars. CAPE CANAVERAL, Fla. -- NASA began a historic voyage to Mars with the Nov. 26 launch of the Mars Science Laboratory, which carries a car-sized rover named Curiosity. 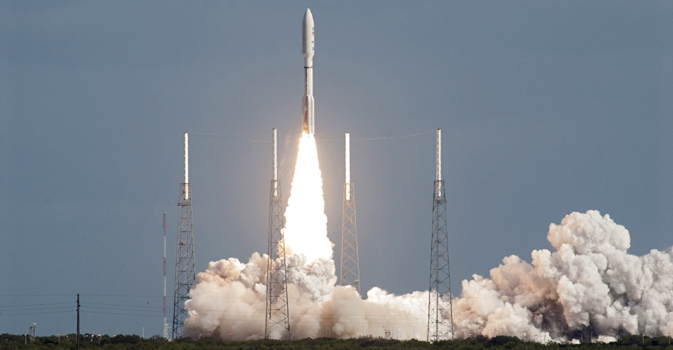 Liftoff from Cape Canaveral Air Force Station aboard an Atlas V rocket occurred at 10:02 a.m. EST (7:02 a.m. PST). The mission is managed by JPL, a division of the California Institute of Technology in Pasadena, for NASA's Science Mission Directorate in Washington. The rover was designed, developed and assembled at JPL. NASA's Launch Services Program at the Kennedy Space Center in Florida managed the launch. NASA's Space Network provided space communication services for the launch vehicle. NASA's Deep Space Network will provide spacecraft acquisition and mission communication. For more information about the mission, visit: http://www.nasa.gov/msl and http://marsprogram.jpl.nasa.gov/msl/ . For more information about the Deep Space Network, visit: http://deepspace.jpl.nasa.gov/dsn . A region on the rim of Endeavour Crater on Mars that has been named 'Turkey Haven,' Credit: NASA/JPL, colorization by Stu Atkinson. What does a Mars Rover do for the Thanksgiving holiday? While one rover will be sitting on the launchpad, preparing to head to the Red Planet (MSL/ Curiosity) the Opportunity rover has now trekked to an enticing outcrop near the summit of Cape York on the rim of Endeavour Crater. This summit or ridge has been named “Turkey Haven” by the MER science team, as this is where Oppy will conduct scientific studies over the four-day-long US holiday. The image above was taken a few days ago, showing the Turkey Haven ridge. Our pal Stu Atkinson has provided a beautiful color rendering, and you can see all the rocks that the rover will be looking at more closely with its suite of instruments and cameras. You can see more images of this area, including 3-D versions on Stu’s site, Road to Endeavour. At the time of the flyby, the 400m-wide space rock was only 324,600 kilometers away, about 85% the distance from Earth to the Moon. This allowed amateur and professional astronomers alike to study the asteroid in unprecedented detail. having read that results from the Arecibo radar indicated it to be a very dark, nearly spherical object some 400 meters in diameter." 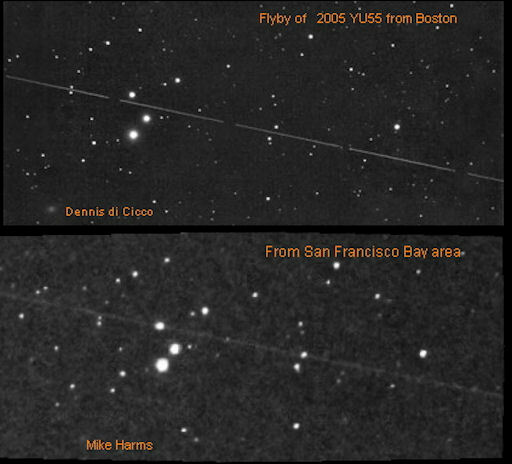 Radar image of 2005 YU55, acquired in April 2010. Credit: NASA/Cornell/Arecibo. The 400-meter-wide asteroid 2005 YU55 is currently zipping through the inner Solar System at over 13 km (8 miles) a second. On Tuesday, November 8, at 6:28 p.m. EST, it will pass Earth, coming within 325,000 km (202,000 miles). This is indeed within the Moon’s orbit (although YU55′s trajectory puts it a bit above the exact plane of the Earth-Moon alignment.) Still, it is the closest pass by such a large object since 1976… yet, NASA scientists aren’t concerned. Why? 2005 YU55′s miniscule gravity will not cause earthquakes. It has no magnetic field. It will not strike another object, or the Moon, or the Earth. It will not come into contact with cometary debris, Elenin, a black dwarf, Planet X, or Nibiru. (Not that those last three even exist.) No, YU55 will do exactly what it’s doing right now: passing through the Solar System. It will come, it will go, and hopefully NASA scientists – as well as many amateur astronomers worldwide – will have a chance to get a good look at it as it passes. Jason is a graphic artist from Rhode Island now living and working in Dallas, Texas. He writes about astronomy and space exploration on his blog Lights In The Dark, here on Universe Today and also on Discovery News. NEXT SUMMER . HERE IS A CLOSE UP PHOTO OF VESTA TAKEN JULY 18. MORE ON VESTA ON MY VESTA PAGE AT LEFT MENU. July 21, 2011 - PASADENA, Calif. -- NASA's Dawn spacecraft obtained this image with its framing camera on July 18, 2011. It was taken from a distance of about 6,500 miles (10,500 kilometers) away from the protoplanet Vesta. The smallest detail visible is about 1.2 miles (2.0 km). ATLANTIS LANDED ON JULY 21st at 5:57 AM EDT ENDING THE 30 YEAR SHUTTLE MISSION. 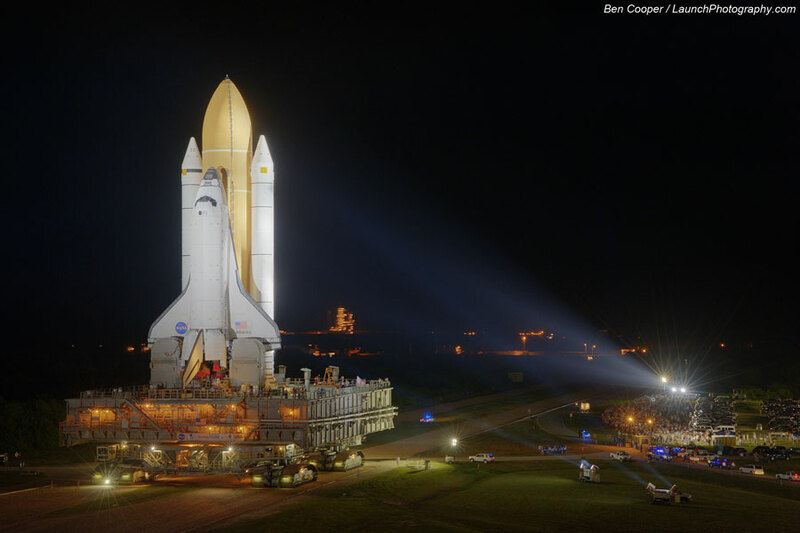 THE LAST ROLL OUT OF A SPACE SHUTTLE EVER!!!! Explanation: In the final move of its kind, NASA's Space Shuttle Atlantis was photographed earlier this month slowly advancing toward Launch Pad 39A, where it is currently scheduled for a July 8th launch to the International Space Station. The mission, designated STS-135, is the 135th and last mission for a NASA space shuttle. Atlantis and its four-person crew will be carrying, among other things, the Multi-Purpose Logistics Module Raffaello to bring key components and supplies to the ISS. Pictured above, the large Shuttle Crawler Transporter rolls the powerful orbiter along the five-kilometer long road at less than two kilometers per hour. Over 15,000 spectators, some visible on the right, were on hand for the historic roll out. On 2008 DEC 12 at 4:39 PM EST, the moon was at a distance of 221,559.7 miles away. Before that one, the closest full moon was on 1993 March 8. Now see more about the cycle that the current full moon this month and the one in March, 1993 are part of. 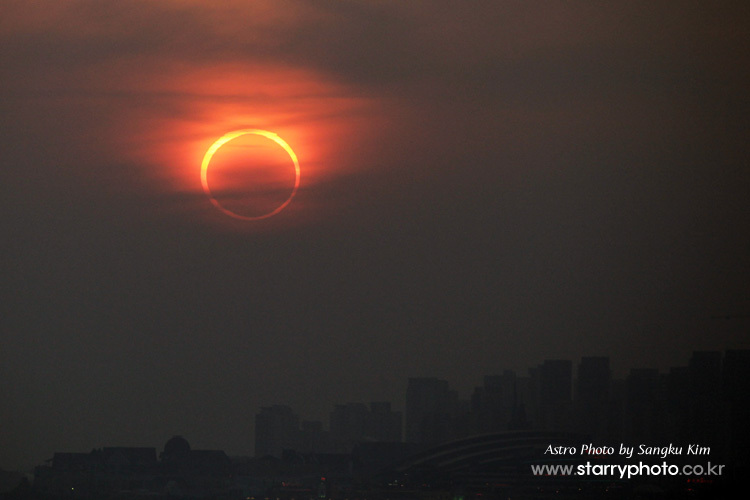 The Saros Cycle of about 18 years and a third of a month is generally associated with recurring eclipses. SINCE THE SURFACE OF THE EARTH IS CLOSER TO THE MOON THAN ITS CENTER. The chart could be extended into both the past and the future at saros intervals - but the distances would be greater. 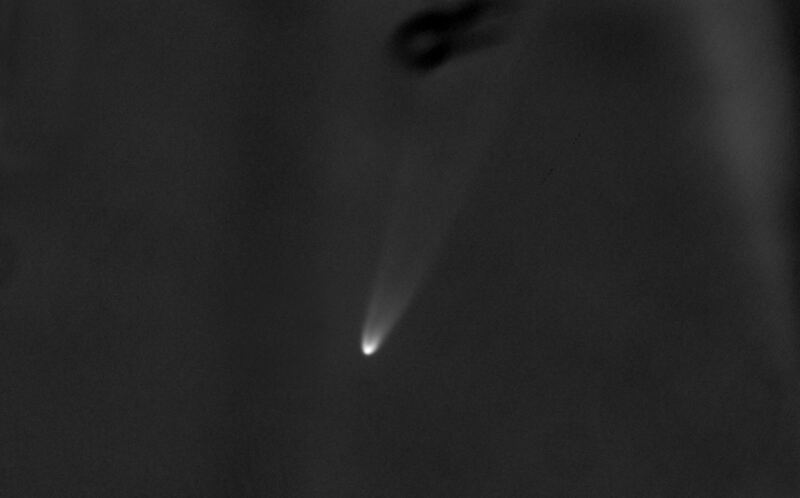 NASA's Stardust-NExT mission took this image of comet Tempel 1 at 11:39 PM EST on Feb 14, 2011. The comet was first visited by NASA's Deep Impact mission in 2005. "Jupiter is getting more difficult now," writes imager Christopher Go in the Philippines. He caught this view of the re-formed South Equatorial Belt - SEB - (above center) in twilight on February 11th just before Jupiter disappeared behind his building's roof. The Great Red Spot is at left. "The SEB is already red in this area and it is also very turbulent," he notes. "The NEB is dark red, and note the dark and white ovals on the NEBn." South is up. TO BE PRECISELY OPPOSITE THE SUN ON 2011 FEB 6 ABOUT 7:30 PM EST - NEAR SUPERBOWL HALF-TIME. for 2011 February 6 at 6 AM EST. The dotted lines show the angular displacement from the Sun. The Numbers on the X & Y axes are in Astronomical Units (AU). 1 AU = 92,955,807 Miles = The Average Earth-Sun Distance. Asteroid 2011 CQ1 was discovered by the Catalina Sky Survey on February 4 and made a record close Earth approach 14 hours later on February 4 at 19:39 UT (14:39 EST). It passed to within 0.85 Earth radii (5480 km) of the Earth's surface over a region in the mid-Pacific. This object, only about one meter in diameter, is the closest non-impacting object in our asteroid catalog to date. 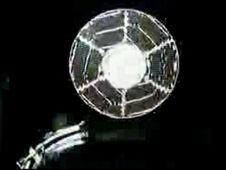 Prior to the Earth close approach, this object was in a so-called Apollo-class orbit that was mostly outside the Earth's orbit. Following the close approach, the Earth's gravitational attraction modified the object's orbit to an Aten-class orbit where the asteroid spends almost all of its time inside the Earth's orbit. 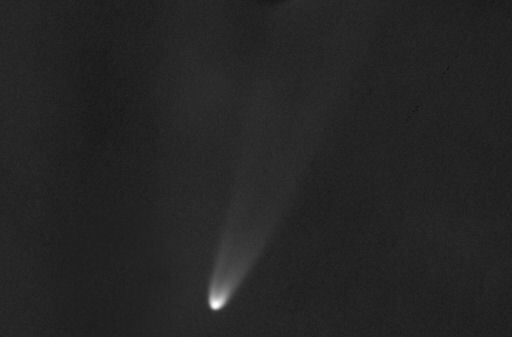 January 26, 2011 - Pasadena, CA--NASA's Stardust spacecraft has downlinked its first images of Comet Tempel 1, the target of a flyby planned for Valentine's Day, Feb. 14. The images were taken on Jan. 18 and 19 from a distance of 26.3 million kilometers (16.3 million miles), and 25.4 million kilometers (15.8 million miles) respectively. On Feb. 14, Stardust will fly within about 200 kilometers (125 miles) of the comet's nucleus. 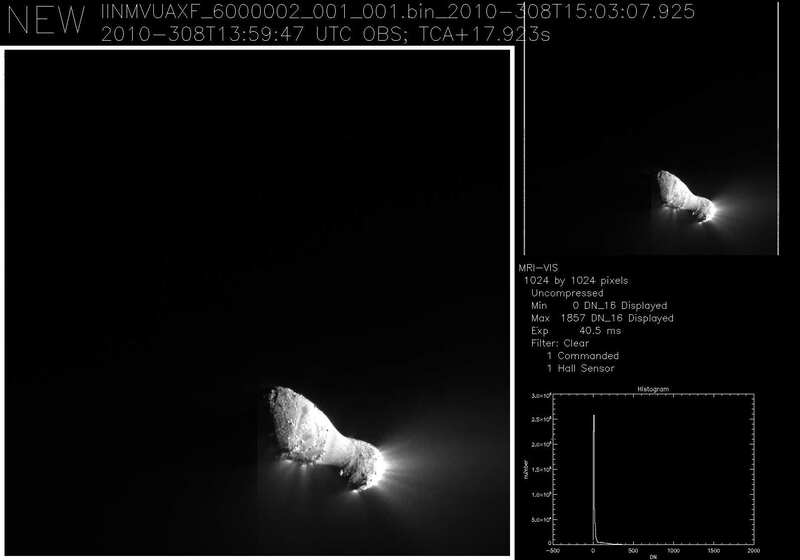 The first image of Comet Tempel 1 taken by NASA's Stardust spacecraft is a composite made from observations on Jan. 18 and 19, 2011. 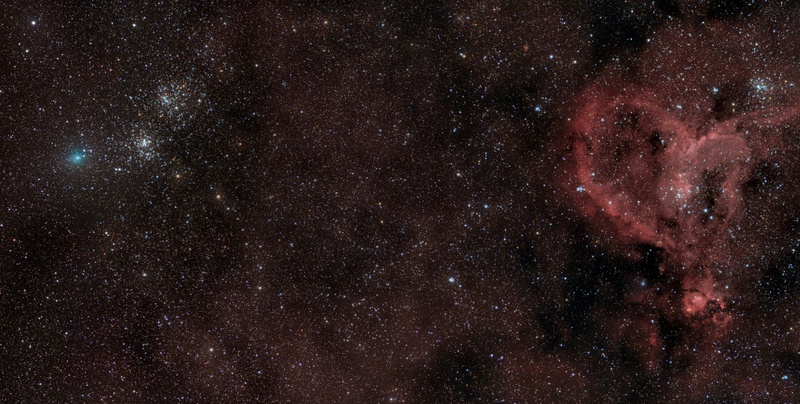 The panel on the right highlights the location of Comet Tempel 1 in the frame. At 11:42 PM EST on Valentine's Day (Feb. 14 in U.S. time zones), Stardust will fly within about 200 kilometers (125 miles) of the comet's nucleus. "This is the first of many images to come of Comet Tempel 1," said Joe Veverka, principal investigator of NASA's Stardust-NExT mission from Cornell University, Ithaca, N.Y. "Encountering something as small and fast as a comet in the vastness of space is always a challenge, but we are very pleased with how things are setting up for our Valentine's Day flyby." The composite image is a combination of several images taken by Stardust's navigation camera. Future images will be used to help mission navigators refine Stardust's trajectory, or flight path, as it closes the distance between comet and spacecraft at a rate of about 950,000 kilometers (590,000 miles) a day. On the night of encounter, the navigation camera will be used to acquire 72 high-resolution images of the comet's surface features. Stardust-NExT mission scientists will use these images to see how surface features on comet Tempel 1 have changed over the past five-and-a-half years. (Tempel 1 had previously been visited and imaged in July of 2005 by NASA's Deep Impact mission). Launched on Feb. 7, 1999, Stardust became the first spacecraft in history to collect samples from a comet (comet Wild 2), and return them to Earth for study. While its sample return capsule parachuted to Earth in January 2006, mission controllers were placing the still-viable spacecraft on a path that would allow NASA the opportunity to re-use the already-proven flight system if a target of opportunity presented itself. In January 2007, NASA re-christened the mission "Stardust-NExT" (New Exploration of Tempel), and the Stardust team began a four-and-a-half year journey for the spacecraft to comet Tempel 1. This will be the second exploration of Tempel 1 by a spacecraft (Deep Impact). Along with the high-resolution images of the comet's surface, Stardust-NExT will also measure the composition, size distribution and flux of dust emitted into the coma, and provide important new information on how Jupiter-family comets evolve and how they formed 4.6 billion years ago. 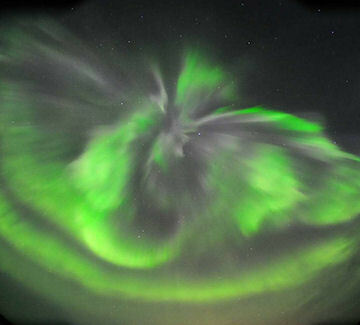 "The whole evening was a perfect show with strong auroras in many colors," says Bubek. 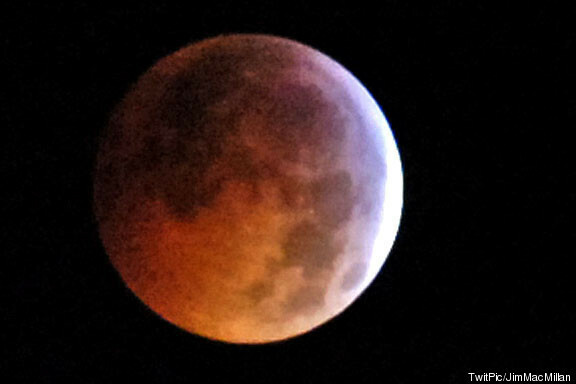 "We were able to capture some fantastic images."
. NOAA forecasters estimate a 30% chance of high-latitude geomagnetic activity when the solar wind stream arrives. 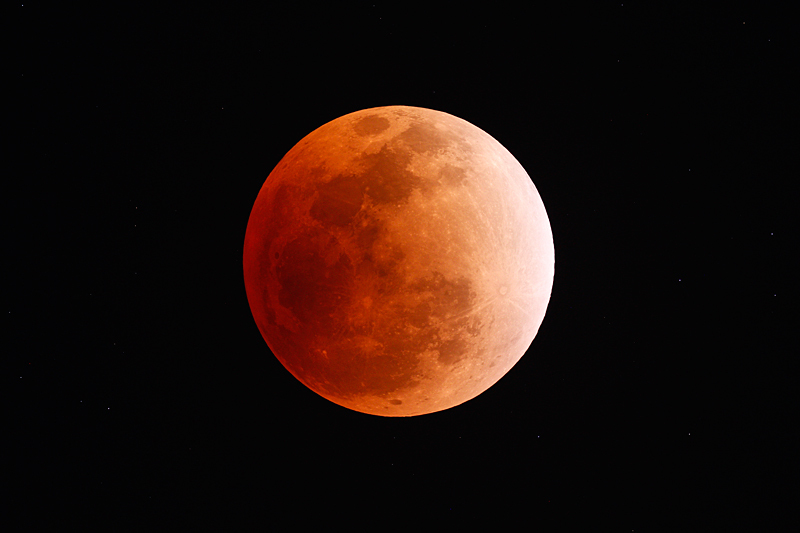 THE LAST WINTER SOLSTICE TOTAL LUNAR ECLIPSE OCCURRED IN THE YEAR 1638 AND WILL NOT RECUR UNTIL THE YEAR 2094. THE YEAR 2485 WHICH WILL ALSO OCCUR ON THE WINTER SOLSTICE. 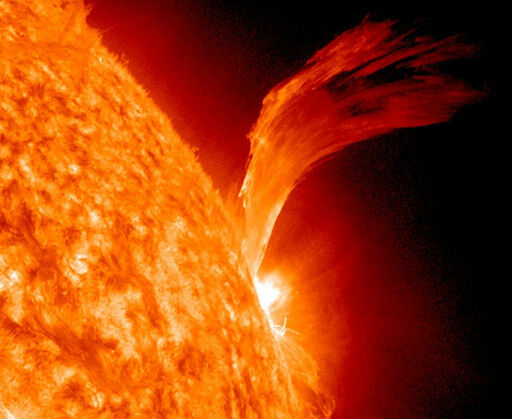 An active sunspot (1123) erupted early on the morning of Nov. 12th, producing a C4-class solar flare and apparently hurling a filament of material in the general direction of Earth. 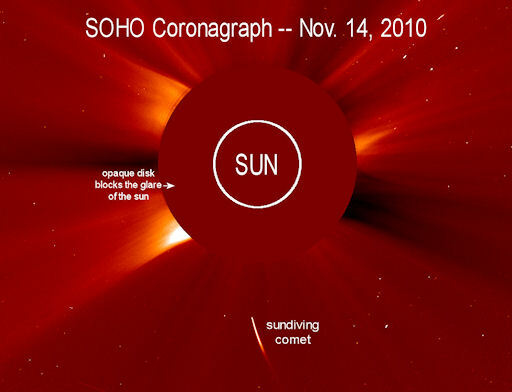 Coronagraph images from the Solar and Heliospheric Observatory (SOHO) and NASA’s twin STEREO spacecraft show a faint coronal mass ejection emerging from the blast site and heading off in a direction just south of the sun-Earth line. The cloud could deliver a glancing blow to Earth’s magnetic field sometime on Nov. 14th or 15th. 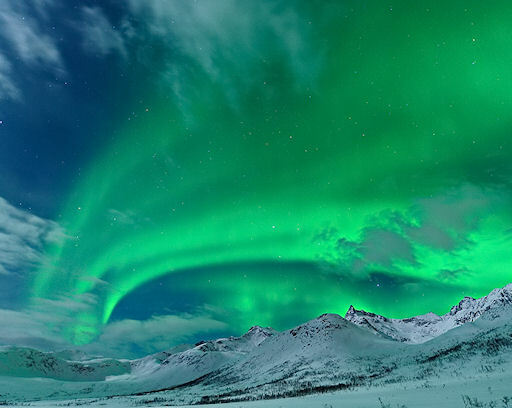 High latitude sky watchers could see auroras on those dates. Japanese comet hunter Masanori Uchina first noticed the sundiver in coronagraph images from the Solar and Heliospheric Observatory (SOHO) on Nov. 13th. At the time it was a dim and distant speck, but it rapidly brightened on Nov. 14th as it approached the hot sun. Now it just a dissipating haze of vapor and comet dust. The comet was likely a member of the Kreutz sungrazer family. 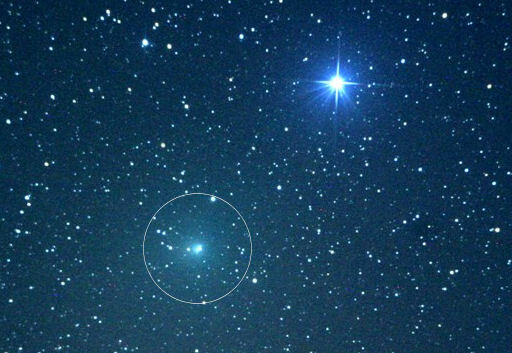 Named after a 19th century German astronomer who studied them in detail, Kreutz sungrazers are fragments from the breakup of a giant comet at least 2000 years ago. Several of these fragments are thought to pass by the sun and disintegrate every day. Most are too small to see but occasionally a bigger fragment like this one attracts attention. The spacecraft went through a cool-down period at the end of September to optimize the capabilities of the near-IR spectrometer and to carry out a Trajectory Correction Maneuver (TCM). This maneuver changed our target point based on our improved knowledge of the position of the comet relative to the spacecraft. We think that the new target point will be within 100-200 km of the desired flyby point (which is 700 km from the nucleus). We expect our next and final TCM to be on October 27. We have a contingency plan for a TCM on November 2 in case the previous TCM does not perform as expected. We have been receiving Hartley 2 data from a variety of other spacecraft and collaborators. The WISE mission released data acquired in May. Those data will be useful in understanding the onset of activity by the comet as it approaches the sun in its orbit. Weaver et al. released Hubble Space Telescope images acquired on September 25. The HST images are particularly valuable because they allowed us to confirm that the cometary nucleus is separable from the coma. Eventually, we will be able to separate the nucleus from the coma within our own data. For now, HST has a huge advantage over our own cameras in this respect due to the much larger aperture of HST coupled with the fact that Earth and HST were much closer to the comet than was our spacecraft. These data are consistent with earlier determinations of the size of the nucleus. 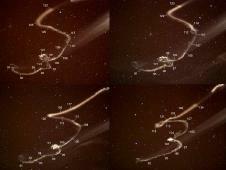 We have also been receiving widespread reports of jets in the coma of the comet. 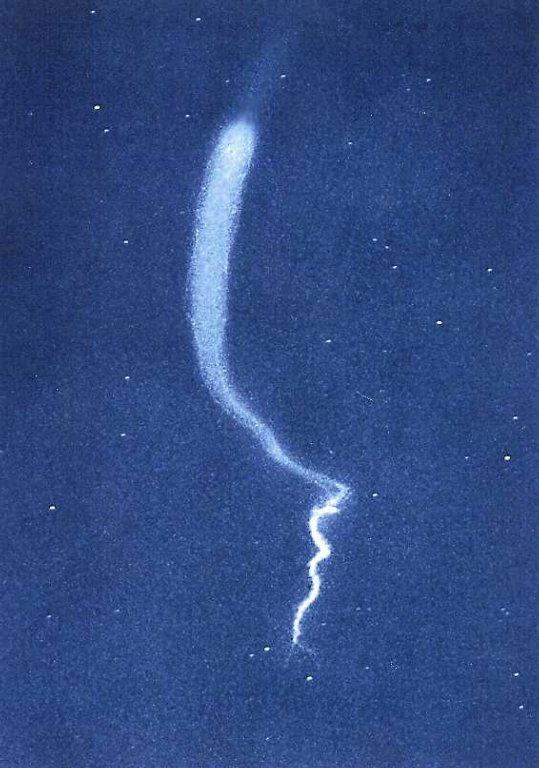 The first such report was from Matthew Knight and colleagues at Lowell Observatory who found jets in the gas (the unstable radical CN) but not in the dust during an August observing run . Since then, we have had more recent reports of jets from both professional and amateur observers. At 22:00 UT (6 pm EDT, 3 pm PDT), the TCM-22 burn will occur if needed. The spacecraft is now 1.8 million km from the comet. 03 November 2010: Final preparation begins for the start of the critical sequence. The last pre-encounter data download will occur today. A decision will be made by the management team as to whether a pointing update or commanded time offset needs to be executed prior to closest approach while the spacecraft is still 1 million km from the comet. The E-18 hour to E+30 minute high resolution encounter observation sequence will commence at 20:50 UT (3:50 pm EDT, 12:50 pm PDT) with all data of the encounter stored onboard the spacecraft because the high gain antenna (HGA) is pointed away from the Earth and not capable of downlinking data during the encounter sequence. 04 November 2010: AutoNav is expected to be enabled at E-50 minutes and fly the spacecraft through closest approach. The cometary nucleus will be resolved ~1 hour out with the spacecraft 45,000 km away from its target. **Closest approach of comet Hartley 2 is expected to occur at ~ 13:50 UT (9:50 AM EDT, 6:50 am PDT) at a distance of 700 km. ** Hartley 2 will be 1.064 AU from the Sun and 0.156 AU from the Earth at this time. The spacecraft will be approaching the comet at a phase angle of 86 degrees. The MRI pixel scale at closest approach will be 7 m/pixel, giving a nuclear diameter of ~170 pixels in the highest resolution images. NASA TV will be covering the EPOXI Flight and Science Teams at JPL from 13:30 - 15:15 UT (9:30- 11:15am EDT, 6:30 - 8:15 am PDT). The first data downlink after encounter is scheduled to start at E+30 minutes, once the spacecraft's HGA is pointed to the Earth. 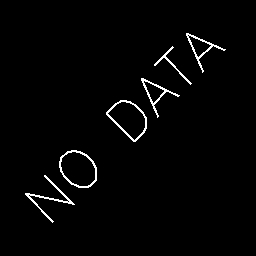 The data will continue to download from the spacecraft through 06 November 2010. A post-encounter live press briefing is scheduled for 20:00 UT (4 pm EDT, 1 pm PDT) at JPL and will include members from the Flight and Science Teams as well as a NASA HQ representative. Prior to the press conference, 5 raw images from closest approach will be released on the EPOXI website, epoxi.umd.edu, as soon as they are available from the spacecraft. Processed versions of these images will be presented during the press conference. The press conference is scheduled to air on one of NASA's TV channels; however, space shuttle coverage may preempt EPOXI coverage on the main NASA TV channel, so check the education and outreach channels, as well as the web. 06 November 2010: The encounter data downlink will have completed and the E+2 to E+12 day post-encounter observations will begin with continuous imaging and downlink. Imaging will occur every 2 minutes and spectral scans will be collected every 15 minutes. 16 November 2010: The E+12 to E+21 day sequence is kicked off. These observations have a reduced acquisition frequency, with both imaging and spectra collected every 30 minutes. 30 November 2010: The last EPOXI observations will take place with a post-encounter cruise calibration. The EPOXI Science Team will continue to analyze data from Hartley 2 for several months. Key science results will be posted to the EPOXI website, epoxi.umd.edu, as they are released. The above is from the EPOXI NASA website. On NOVEMBER 4 a NASA spacecraft - EPOXI will fly by the comet's small nucleus estimated to be only 1.5 kilometers in diameter. He caught the comet gliding by lambda Cassiopeia, a 6th magnitude double star. "In 7x50 binoculars, the comet is diffuse and very large," says Scarmato. "I estimate its size around 20-arcminutes and brightness at magnitude +7.5." Two weeks after Comet Hartley 2 has its close encounter with Earth, NASA will have a close encounter with the comet. The EPOXI spacecraft (formerly known as Deep Impact) is hurtling toward Comet Hartley now, and on Nov. 4th it will fly 435 miles from the comet's active icy nucleus. The encounter will mark only the fifth time in history that a spacecraft has been close enough to image a comet's core. Until then, amateur astronomers can monitor the comet as it glides through the constellation Cassiopeia in the evening sky. 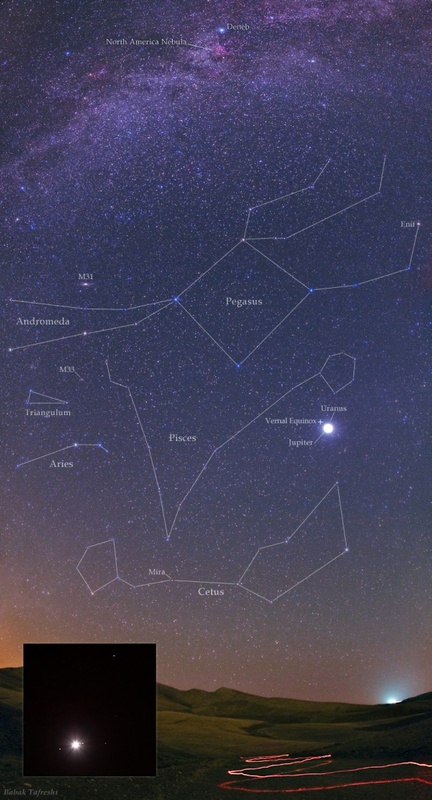 A finder chart from Sky and Telescope shows the comet passing by a variety of stars and deep-sky objects, offering many photo-ops in the nights ahead. 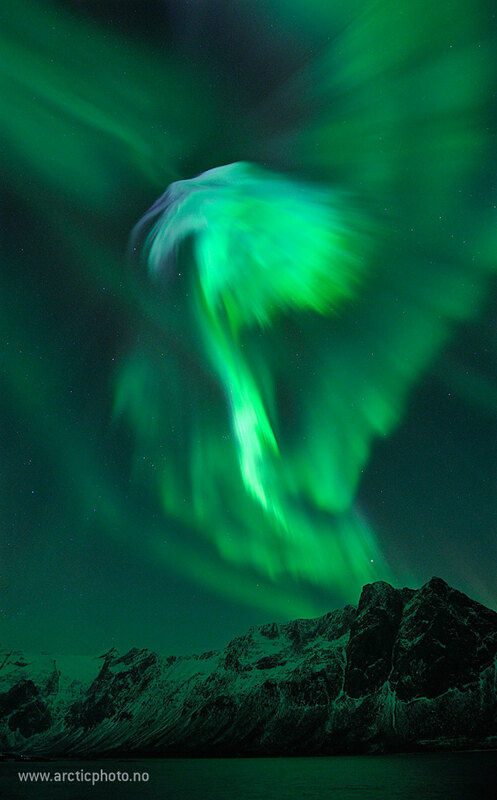 Thilo Bubek took the picture not far from Tromsø, Norway. "We had some nice auroras," he says, with what can only be described as Norwegian understatement. "The clouds and calm sea contributed to a photogenic scene." This is the time of year when south-pointing magnetic fields from the sun frequently puncture our bubble of protection against the solar wind. 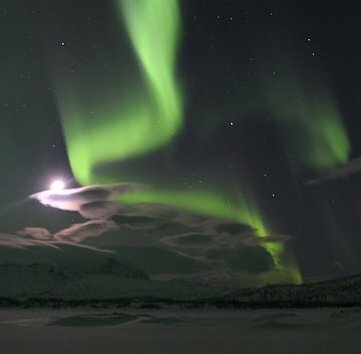 High latitude sky watchers should be alert for equinox auroras. 2010 RF12 is a near-Earth asteroid (type called an Aten - See more on this at Left Menu on my Apophis page under Asteroids - the First 1000) that passed between the Earth and the Moon on September 8, 2010 at 5:12 pm EDT (2112 GMT), approaching within 49,326miles from the earth above Antarctica. NASA estimated its size to be between 20 and 46 feet (10 +/- 4 meters) in diameter. The asteroid was discovered by the Catalina Sky Survey near Tucson, Arizona on September 5, 2010 along with 2010 RX30. Update #1: Two new movies of the eruption are available from the Solar Dynamics Observatory--a big picture view in black-and-white and a spectacular close-up in three extreme ultraviolet colors. 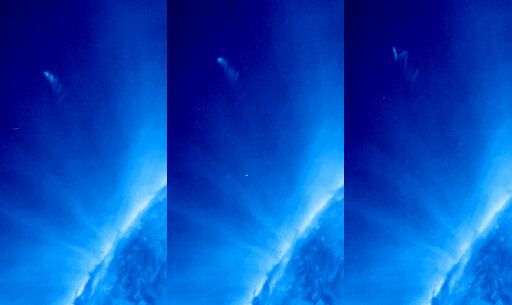 Update #2: NASA's STEREO-Ahead spacecraft is stationed almost directly above sunspot 1105. A first-look movie shows a shadowy "solar tsunami" wave racing away from the blast site. Title this 'Zombie Galaxies' or 'Night of the Living Galaxies.' Astronomers have found mysterious, giant loops of ultraviolet light around old, massive galaxies, which were presumed to be "dead," and these galaxies seem to have come back to life. Somehow these "over-the-hill galaxies" have been infused with fresh gas to form new stars that power these truly gargantuan rings, some of which could encircle several Milky Way galaxies. The discovery of these rings implies that old bloated galaxies that were once devoid of star-making can be reignited with star birth, and that galaxy evolution does not proceed straight from the cradle to the grave. "In a galaxy's lifetime, it must make the transition from an active, star-forming galaxy to a quiescent galaxy that does not form stars," said Samir Salim, lead author of a recent study and a research scientist in the department of astronomy at Indiana University, Bloomington. "But it is possible this process goes the other way, too, and that old galaxies can be rejuvenated." Using two orbiting observatories, NASA's Galaxy Evolution Explorer and Hubble Space Telescope, the astronomers surveyed a vast region of the sky in ultraviolet light. GALEX picked out 30 elliptical and lens-shaped "early" galaxies with puzzlingly strong ultraviolet emissions but no signs of visible star formation, and Hubble was used to take a closer look. What Hubble showed shocked the astronomers. Three-quarters of the galaxies were spanned by great, shining rings of ultraviolet light, with some ripples stretching 250,000 light-years. A few galaxies even had spiral-shaped ultraviolet features. "We haven't seen anything quite like these rings before," said Michael Rich, co-author of the paper and a research astronomer at UCLA. "These beautiful and very unusual objects might be telling us something very important about the evolution of galaxies." But astronomers are unsure where the gas for this galactic resurrection came from and how it has created rings. One possibility is that a smaller galaxy merged with a big, old one, bringing in fresh gas to spawn hordes of new stars, and could in rare instances give rise to the ring structures as well. But the researchers have their doubts about this origin scenario. "To create a density shock wave that forms rings like those we've seen, a small galaxy has to hit a larger galaxy pretty much straight in the center," said Salim. "You have to have a dead-on collision, and that's very uncommon." Another option that the astronomers like better is that the rejuvenating spark could have come from a gradual sopping-up of the gas in the so-called intergalactic medium, the thin soup of material between galaxies. This external gas could generate these rings, especially in the presence of bar-like structures that span some galaxies' centers. Ultimately, more observations will be needed to show how these galaxies began growing younger and lit up with humongous halos. Salim and Rich plan to search for more evidence of bars, as well as faint structures that might be the remnants of stellar blooms that occurred in the galaxies' pasts. Rather like recurring seasons, it may be that galaxies stirred from winter can breed stars again and then bask in another vibrant, ultraviolet-soaked summer. MORE AURORAS IN THE OFFING? Earth's magnetic field is still reverberating from the CME impact of August 3rd, which sparked auroras as far south as Wisconsin and Iowa in the United States. Analysts believe a second CME is right behind it, due to arrive on August 5th. 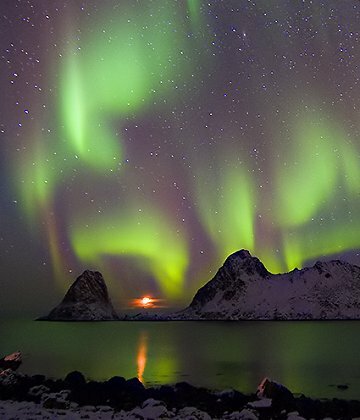 A second impact could re-energize the fading geomagnetic storm and spark a new round of Northern Lights. 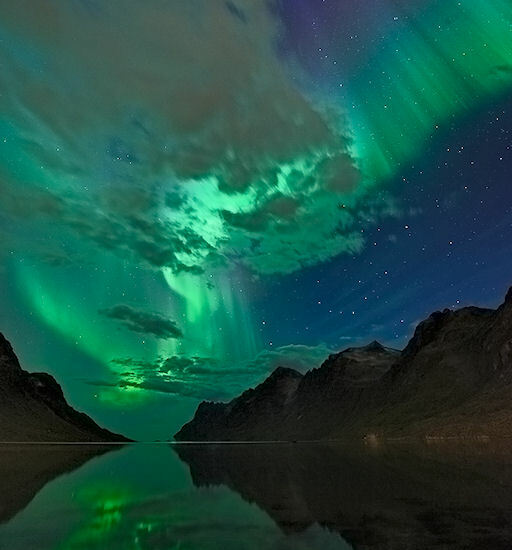 High-latitude sky watchers should remain alert for auroras. Meanwhile in Ringsaker, Norway, the auroras were so bright "we could see them through clouds, moonlight and midnight sunlight," says Ragnar Johnskås. "It was a lovely show." Browse the gallery for more! into a seamless, true-color mosaic of every square kilometer (.386 square mile) of our planet. Your tax dollars at work, these images are freely available to educators, scientists, museums, and the public. This record includes preview images and links to full resolution versions up to 21,600 pixels across. taken BELOW by the Apollo 17 crew in 1968. The original Blue Marble by Apollo 17.
to witness sun shows nearly every day as the sun hangs around 9.3 degrees above the horizon and ice lingers in the sky." far south as Scotland. "On Monday night, we had the first auroras I have seen here in years,"
reports Gordon Mackay of Campsie Fells. 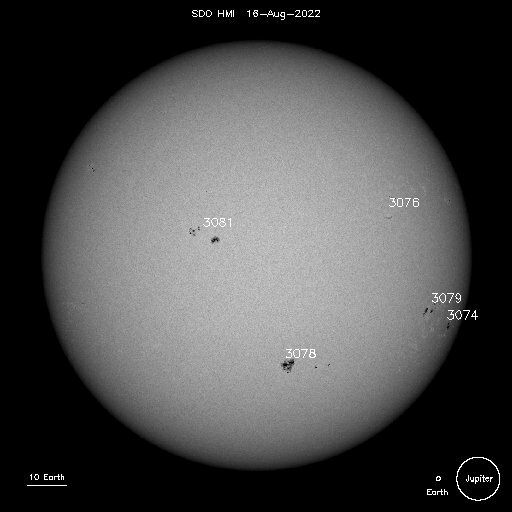 All this activity is a sign that the sun is coming back to life after a long, deep solar minimum. again buffeting Earth's magnetic field. NOAA forecasters estimate a 25% to 30% chance of more geomagnetic activity tonight. side-by-side. It's a must-see event: sky map. telescope now than at any time between 2008 and 2014. 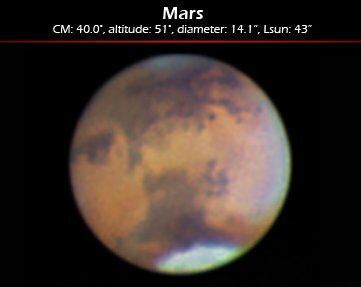 "I photographed Mars at 10 minute intervals for more than three hours," says Lawrence. "Here is the animation. It shows a lot of surface markings including the dramatic 'Eye of Mars,' Solis Lacus." complex is rotating away at upper left, and dark, narrow Mare Sirenum is coming into view at top right. Note the small, extra-bright white patch in the north polar cap. SOUTH IS UP. see through the same telescope. is 14 .1 arcseconds in angular diameter, less than 1 percent the diameter of the Full Moon. A PHENOMENON KNOWN AS OPPOSITION AT 2:43 PM EST ON JANUARY 29. 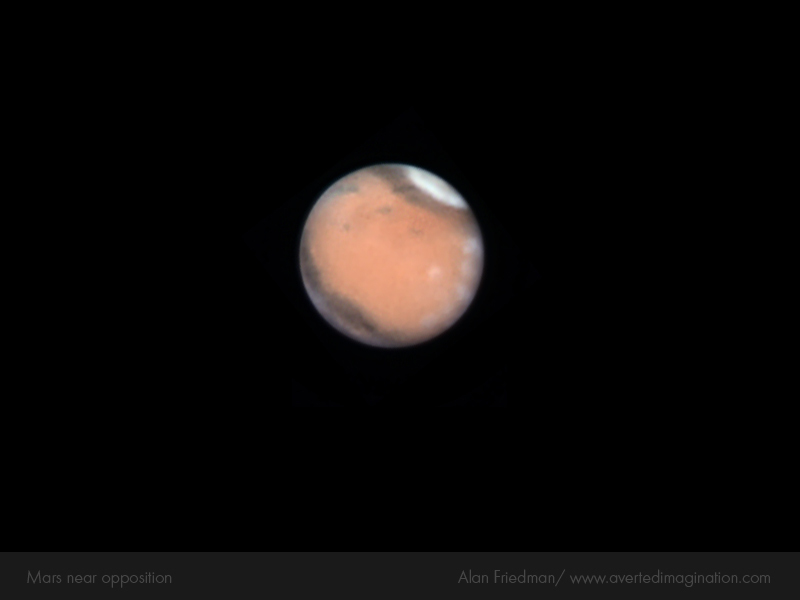 CLOSE ENCOUNTER WITH MARS: ON JAN 27, a few hours after sunset, go outside and look east. That bright orange star hanging halfway up the sky is Mars having a close encounter with Earth. 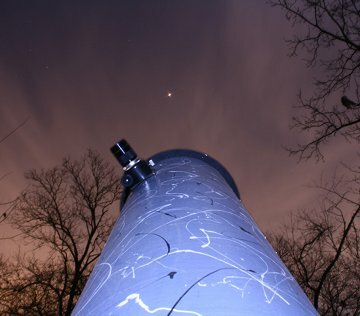 "The view through the eyepiece was very nice," says Zubenel. "The northern polar cap and Aurorae Sinus (a dark feature in the southern hemisphere of Mars) were easily seen at 488X magnification." The solar wind's impact caused a geomagnetic storm registering 5 on the 0-to-9 K-index scale of magnetic disturbances. It was the first geomagnetic storm of the year--but probably not the last. 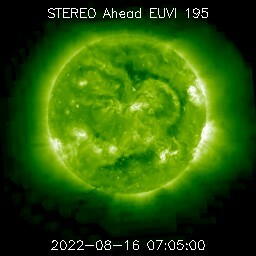 With active sunspot 1041 turning toward Earth, there could be more in the offing. 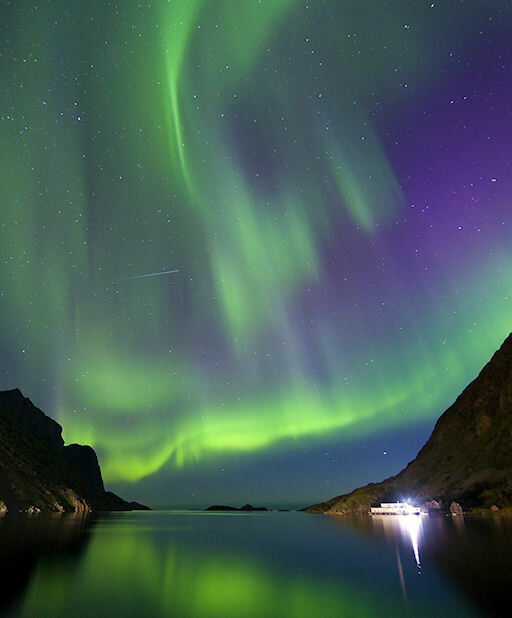 High-latitude sky watchers should remain alert for auroras. OVER 1000 YEARS INTO THE FUTURE !! !